The Arizona Trail has a death grip on me, but that's ok. I'll take whatever the AZT can dish out as it's usually a very rewarding experience. A few weekends ago we put together a clinic of sorts for wannabe bikepackers that went over quite well. I had been eyeballing the section of AZT north of AZ87 for some time and thought this could be another opportunity to get some noobs out to the backcountry. The cool thing about the route I put together was the unknown, unfamiliarity of the trail / forest roads that we'd be riding. That was my main disclaimer, be prepared for whatever the trail gives you. There are few trip reports from the area, most notably the ride Seron did a couple years ago. Saturday morning came and as we all gathered at the trailhead. We were 9 riders strong, 7 of us would camp out while Jeff & Nancy did their own shorter single day loop. Jeff minus the sleep system. The first 5 miles or so were pretty good, forested singletrack with a bit of chunk for good measure. The drop down into Jacks Canyon was fun. We came to a second forest road crossing then began scratching our heads, where's the trail? A couple of minutes of poking around led us to a ranchers gate and we spied an AZT marker on the other side. Snack break by one of the many gates. One of the smooth(er) sections of jeep road. Most of the gang at a mid-passage trailhead. The next 15 or so miles were kind of a blur to me. It was a steady dose of primitive singletrack mixed in with some uber chunky 4x4 'roads'. Throw in a vague vanishing trail every once in a while and we were on constant alert and working hard for every mile we rode. Somewhere near Bargaman Park the group split up, Ray, Caroline, Steve & Devon pushed ahead, I stayed within visual contact for a few miles then decided to wait up & ride with Donna & Arturo near one of easy-to-miss turns. Greenery was everywhere thanks to a plentiful monsoon season. The trail was starting to get really good. Donna & Arturo pop out of the trees. Donna on her maiden bikepacking trip! Arturo about to complete his longest ride to date. Some of the meadows are still awash with color. Mickey seems to be enjoying the ride!! The closer we rode to Lake Mary Rd the better the singletrack became. After the morning of bone jarring terrain this was a most welcomed sight! We crossed the pavement and soon arrived at Gooseberry Springs trailhead thus completing the entire Happy Jack passage of the AZT. Continuing north we entered into the Mormon Lake passage for a few miles of more sweet singletrack before reaching the forest road that would lead us down to Mormon Lake. Not many people hang around for winter it appears. 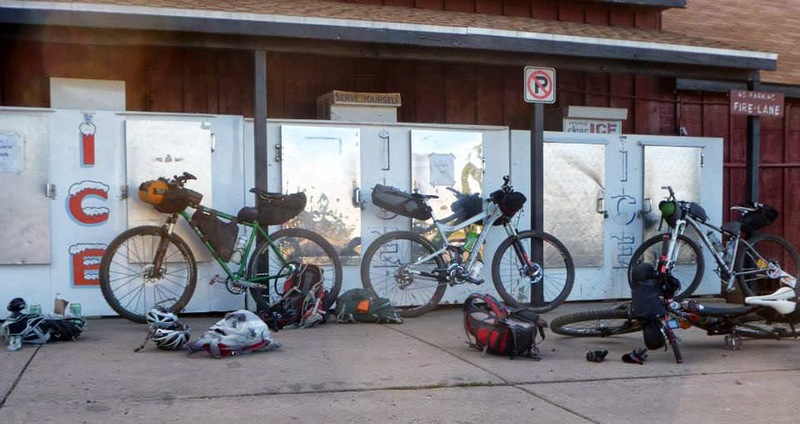 Rolling along the pavement into Mormon Lake Lodge I saw a familiar sight, four bikepacking rigs leaned up against the ice machines. We rejoined with the others, picked up some refreshments, topped off our water then began our search for a place to make camp. Hogging the ice machines. Photo by Caroline. The Silver Bullet, can or bike? You decide. We found a nice wooded area a few miles down the road to spend the night. The tents sprang up and we gathered round for the evening grub and tales from the trail. It was a little before 9p when I went to gather my things up for the evening, not so fast....CRAMP!! Oh, it was a doozy, right quad wouldn't relinquish it's death grip on me. I couldn't stand upright for over 5 minutes. When it finally subsided my leg ached like I just finished a monster set of squats. I was concerned that it would give me fits into the night, most notably when I re-positioned myself in the tent for the night. I was about to have other things on my mind. I was putting my stuff into the tent, grabbed my backpack and I gasped, crap, the SPOT tracker was gone! The carabiner was still on my pack, but who knows where it fell off along the 40 miles of the day. 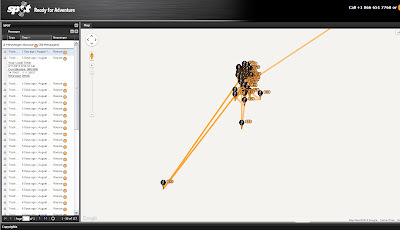 I mentioned it to Arturo and he tried pulling the tracking page up, but it was very slow. I decided to try my phone and much to my surprise I actually had 4G coverage....with T-Mobile...in the woods!!! Small miracle, I know. I sent K a quick text letting her know that we were at camp and not wherever the tracker had been broadcasting for. Next was text to Seron, since it is HIS SPOT!! He fired back the approximate location, then I verified it on the webpage. It appeared it wasn't too far from Lake Mary Rd south of the trailhead we rode through on a more remote section of trail. This was good news, I'll just detour off route to grab it in the morning and try to catch up with the others afterwards. After a couple of hours in the tent I was finally able to shut off my brain and fall asleep. I was awoke around 3:30a to a most uncomfortable situation. I was using my pack as a pillow and I must have squished my bite valve enough to open it. I was soaking wet, down to my waist, sleeping bag was wet, pad was wet, argh. Somehow I managed to fall back asleep in the soggy conditions. Early the next morning things were stirring around camp. Steve took off early to get back home by early afternoon. Ray and Devon followed shortly thereafter. That left myself, Caroline, Donna & Arturo to bring up the back of the pack. I checked the SPOT page one more time and to my surprise the track had moved!! Drat. It appeared that someone had picked up the unit & was headed north towards Flagstaff. So much for my search & rescue mission. I was bummed. We came to a nice climb early on to get everyone warmed up for the day. The second day's route was mostly forest road until the last 5 miles when we'd return to the car via the AZT. We took the slight detour over to Kinnikinick Lake to get some water at the campground only to find out it was a no-facility campground. The lake however, had plenty of water to everyone's surprise. Time to filter. A little pump action filtering. Every so often we'd hit a chunky section of forest road similar to the prior days condition. Thankfully, those didn't last too long. About halfway into the day we rode by Long Lake which was much bigger than I anticipated. The clouds were slowly building, but the miles were beginning to go by faster. Faster, until we hit a small snag in the track we were following. I had hand-drawn most of the second days route based on topo maps, but now we were looking for a turn onto a road that didn't exist! Ahh, the beauty of GPS. I saw that we simply had to backtrack to the last turn about 1/2 mile back, which would in turn lead us over to the route once again. This part of the route had a Tour Divide feel to it!! Arturo brought Mickey along for the adventure. Snack time!! Photo by Caroline. Ready to head on down the road. Photo by Donna. River of gold for miles. Wild horses out for a drink. We rolled up to the AZT and to be honest the trail seemed so unfamiliar even though we were on it the day before! The last 5 miles were really good. It was a nice way to finish another 40+ mile day. We made it back to the car around 2:30p, packed up then went for some lunch at the Clint's Well Cafe. Although the route was super rugged in spots, I loved the remoteness of the area. There are plenty of good sections of trail worth checking out. The hike-a-bike sections were minimal. 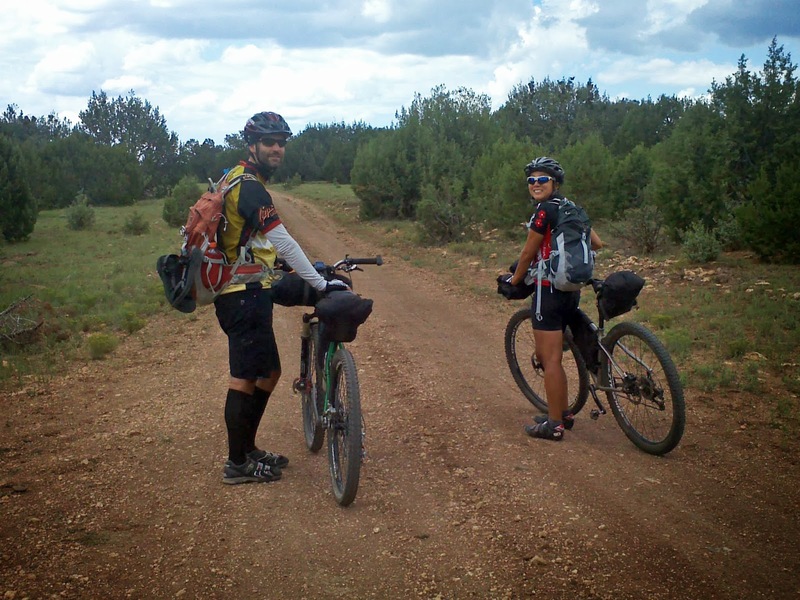 We added two more riders to the bikepacking family, Donna & Devon both made their first overnight ride. Arturo, now a veteran of two trips, topped his previous longest ride ever on the first day, then topped that the next day. Well played. As I pulled into the garage from the drive home I receive a text from Seron: I think that was an errant point, the SPOT still appears to be in the same location. I pulled up the SPOT page and found the view I had on my phone. The point in the lower left made me think someone had picked up the SPOT. As soon as I started to zoom out I realized that the errant point really wasn't all that far from the other points!! I assume that the SPOT page zooms in to a 'best fit' scenario with the last 50 points tracked. 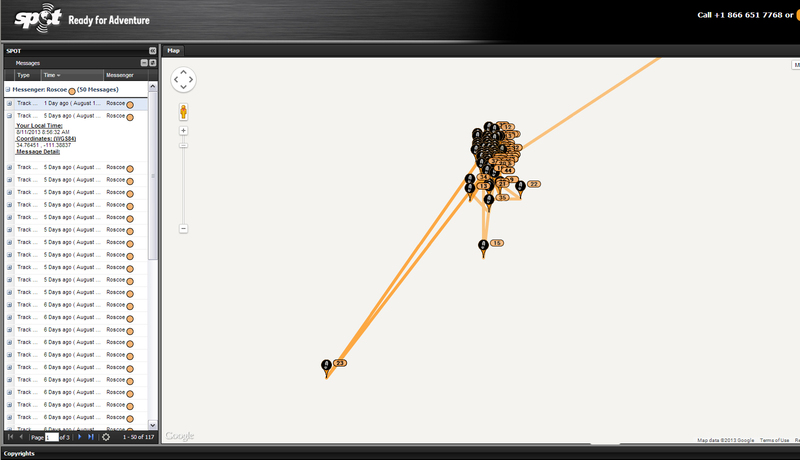 Same view, zoomed out to include earlier points. The workweek was about to start and I couldn't get back up there until Friday afternoon. I was really hoping the remoteness of the trail would work in my favor. I really hadn't budgeted for a $150 replacement for Seron!! I asked Devon if he was able to get down there from Flagstaff since it was a bit closer. Thursday afternoon he took his kids out there and went on the hunt. I had sent him the GPS coordinates from the center of the compiled points along with a map. He combed the area, but didn't see anything. Then on their way back the loot was had!! A huge thanks to Devon for taking the time (and saving me a trip north) to go poking around the woods. I guess geocaching does have its merits!! The funny thing is on Wed Seron forwarded me an email from SPOT for $50 off a new SPOT3 tracker for current subscribers!! I guess the upgrade will have to wait. I also found it a bit ironic that the SPOT homepage is findmespot.com! Wow. Great run of pics from this trip. I love the Mormon Lake pic of the Cards house. Oooo, I like it! I might have to try this when I get back home. 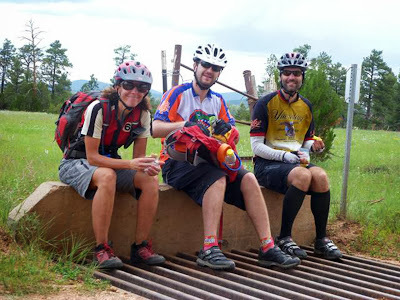 I think I did part of the AZT you described a few years ago (Coco250 + prior recon), but the rest is all new. Thanks for the post/pics, and expect some questions from RRC! Happy trails! Epic! We don't have anything like this here in Georgia. Plus I can't breathe here. Got a line on any jobs in Healthcare IT in AZ? Nice blog. I'll be following it now.